WHEN THERE IS A WILL. WHEN SOMEONE DIES WITHOUT A WILL. Probate attorney, Diron E. Rutty, LLC, has earned the trust of clients throughout New York City, the Bronx, Poughkeepsie, and surrounding counties by skillfully handling their probate matters. Whether someone has passed away with or without a will, the attorneys at Diron Rutty, LLC, know that the Probate Process follows what is typically a painful emotional loss. Our office will assist executors and beneficiaries through this process from the first stage of filing the Petition, through ensuring that all beneficiaries are paid in a timely manner, to the time of the order relieving the Estate Administrator. We will follow your estate administration proceeding, by helping you to carry out your duties according to the law while looking out for your interest. Clients’ needs always come first at Diron Rutty, LLC. If you are appointed executor of a will and must probate the estate, all personal representatives are held personally liable for tax obligations and asset distribution, so it is extremely important to comply with the decedent’s wishes and the law. If you are the proposed administrator, we will assist you in the inventory, collection, and appraisal of the estate’s assets, we will advise you which creditors need to be paid, and will help you decide how to distribute assets in a way which preserves the estate and benefits the beneficiaries. If you are the beneficiary of the estate, we will ensure that the administrator looks out for your best interest and complies with the law, and will stand ready to demand an accounting if you feel that the administrator is not properly carrying out his or her duties. If you are a creditor of the estate, our office will make sure that your rightful claim against the estate gets satisfied at an early stage of the proceeding. Most executors have rarely, if ever, probated a will and know very little probate. We can guide you through this process. The Surrogate’s Court in the county where the decedent lived at death is responsible for overseeing this process. If the decedent owned property in another state, additional proceedings typically are necessary in that state. Probate is the process of proving that the Will is valid. A valid will is one that was properly prepared and executed, determining whether it has been tampered with, and whether it is the genuine and only document setting forth the wishes of its maker in disposing of his/her property. During probate, the Will must be proved to the satisfaction of the court that it is the Last Will and Testament of the person who died. This process usually begins with the executor named in the will filing the original will with the Surrogate’s Court together with the petition. The attached petition identifies the executor, the individuals as listed in the will (beneficiaries), describes the estate’s assets, identifies the witnesses to the will and provides a list of decedent’s relatives who have a right to object to the will and who would benefit if the will was declared invalid in the probate proceeding (heirs-at-law). 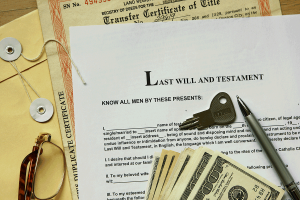 The Executor is responsible for giving notice to anyone that is mentioned in the will. Once the judge in Surrogate’s Court is convinced of the validity of the will, that the appropriate probate notices have been sent to the right people, and if there are no objections, the Executor named in the will is appointed to collect estate assets, distribute the estate and carry out the wishes of the person who died. In order to save the estate time and money, the decedent’s heirs-at-law must sign and have notarized consent to probate form. If any of the heirs-at-law do not agree and refuse to sign and return the consent, the Surrogate’s Court will issue a citation to each heir informing him or her as to the date, time and place for objecting to the probate of the will. Objecting to the will leads to further questioning under oath of the witnesses to the will, the attorney who prepared the will and other necessary parties. Discovery proceedings are utilized to produce the facts and circumstances surrounding the making of the will. A trial is usually conducted to decide if the will is genuine. If after trial, the will cannot be admitted to probate, the estate will pass pursuant to the intestate laws, and the properties will be distributed in equal shares to the decedent’s relatives most closely related. If there is no valid will in existence, the case will be handled differently. Your New York probate attorney will file an administration petition. The court will issue a document called Letters of Administration and will appoint an estate administrator based upon the following priority order of individuals who are eligible to serve as administrator of an intestate estate: surviving spouse, children, grandchildren, parents, and siblings. The job of the administrator will be much the same as that of the executor mentioned above. An estate executor or administrator will protect and preserve the estate, which can include handling bank accounts, investments, cars, and homes. This job carries with it a high degree of responsibility. Failure to act responsibly and with the utmost care can result in an action against the administrator or executor for negligence or mismanagement. In New York, there are intestate succession laws which direct that certain persons receive the estate. If there is a surviving spouse but no lineal descendants (children, grandchildren, or great-grandchildren, natural or adoptive), then the spouse gets the entire estate. If there are lineal descendants, the spouse gets the first $50,000 and the spouse and lineal descendants each take half of the balance. If there is no surviving spouse and no lineal descendants, then the estate goes to any surviving parents of the decedent. If there are no parents, then it goes to other relatives of the decedent, starting with brothers and sisters. If you are involved in a probate matter, Diron Rutty, LLC, will work on your behalf to deal with any unforeseen circumstances that may arise, and ensure that your rights are protected. Contact our estate planning attorneys at 718-324-0404 in New York City, 845-849-9201 in Poughkeepsie, NY, use the form below, or email us at info@DironRuttyLLC.com.